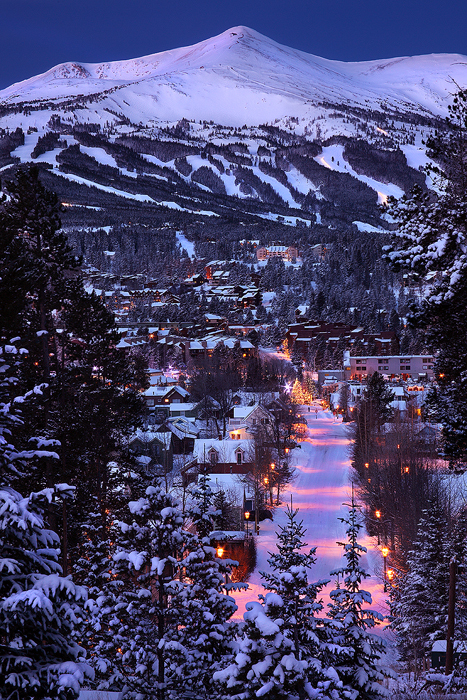 Breckenridge was formally created over 100 years ago in 1859 during the Pikes Peak gold rush. At this time Breckenridge was Part of the Utah Territory, many years before it was admitted into statedhood. Like most of the mid 1800s mining boom towns of the West, gold mining in Breckenridge mostly came to a hault at the end of the century. To this day, many of the original buildings, mines, dredges, and dredge trailings are scattered about the county. On December 16, 1961 Breckenridge Ski Resort was founded on Peak 8 of the Ten Mile Range, almost exactly 50 years before I took this photo. Since then Breckenridge has experienced another boom, this time drawing people from all over the world for snow instead of gold. The resort now operates on four peaks of the Ten Mile Range. Peak Ten, Nine, Eight and Seven, and is one of the most visited ski resorts in all of North America. If you look closely at the top of the mountain you can make out the Imperial Express Super Chair. Added in 2005, the Imperial lift officially became the highest lift in North America at 12.840 feet, only 100 feet short of the summit. Although development is a growing concern, Breck has managed to keep their quaint sleepy mountain town feel. In this photo, Peak 8, looms over town in the early morning light.